The Meditation and Mindfulness Teacher Training Certificate enables individuals to become qualified meditation teachers. It is a highly practical course that has been designed to offer you the knowledge and experience you need to be a competent teacher of meditation. The course is ideal for individuals already practicing meditation or another yogic discipline, qualified yoga and pilates teachers, alternative therapists, life coaches, health professionals, counselors, and others who want to expand their practice or career to include meditation teaching, theory, and methods. Many people join the training course, even though they do not intend to teach, but simply to deepen their practice and knowledge of meditation. This course would enable you to obtain a solid foundation of daily practice so that you could enjoy the many benefits of meditation. The training course includes 40+ videos, 30+ evidence-based guided meditation scripts, 30+ exercises and activities, and downloadable audio meditations, handouts, and worksheets. These materials are divided into 30 teaching sessions, each session incorporates videos, exercises, and meditation practice. The sessions make a comprehensive course (see full curriculum below) and would offer you all that you need to deliver inspiring and responsible meditation sessions. In addition to the comprehensive materials, the course also has its own Facebook group, only for students and graduates of the training. As part of the group, you will be able to ask questions, share meditation techniques, and discuss challenges or insights you had as part of your meditation practice and teaching. Finally, you have free access to a mindfulness teacher, via emails, to discuss any question you might have. The Meditation and Mindfulness Teacher Training has been internationally approved and validated by the CMA (Complementary Medical Association). Once you have completed the training you will receive a formal certificate indicating you are a certified meditation and mindfulness teacher. Session 2: What is Meditation? "I feel I can live every minute if I choose to"
Dr. Itai Ivtzan is a positive psychologist, an Associate Professor at Naropa University, teaching and researching at the MA Clinical Mental Health Counseling: Mindfulness-Based. Over the past 20 years, Dr. Ivtzan has run mindfulness sessions, workshops, and retreats around the world. He is a regular keynote speaker at conferences. He published several books linking mindfulness with psychology and spirituality. Dr. Ivtzan is confident that mindfulness meditation has the power to change individuals – in fact, whole societies – for the better. Accordingly, he has been investing much time in practicing and studying mindfulness, writing books about it, teaching it, and training mindfulness teachers. Meditation can have a far-reaching impact on your life. It facilitates a deeper feeling of peace and calm, while at the same time allowing you to engage with yourself at deeper levels. Additionally, meditation has been scientifically researched, and the results have clearly shown that the practice has important benefits. According to research, meditation increases psychological well-being factors such as acceptance, meaning, happiness and compassion on the one hand, and reduces levels of stress, anxiety, and depression on the other hand. This module will provide you with the knowledge and understanding surrounding meditation, including concepts such as “Presence”, “Authentic Self”, “Enlightenment” and “Awareness”. As teaching meditation begins with a personal experience of it, this teacher training course emphasizes personal practice, alongside the teaching of theory and exercises. You will be trained in a variety of meditation techniques in order to have an intimate and subjective experience of different meditation-based exercises. The list of meditation techniques you will learn as part of this module includes Intention Meditation, Breathing Meditation, Walking Meditation, Smiling Meditation, Body-Scan Meditation, Loving-Kindness Meditation, 1-Minute Meditation, and many more. This course would enable you to psychologically and spiritually grow while engaging with these meditation techniques. As you gain knowledge about meditation and learn the experience of meditation, you will realize how you could offer others a similar experience of expansion. By engaging with the materials on a theoretical level (module 1) and practical level (module 2), you will realize how to apply the techniques you have learned so that you could teach others. This module will provide you with practical tools that would assist you in teaching others. The three modules are not being taught separately; instead, the training continuously moves from one module to another, offering some theory, followed by practice and a teaching session, seamlessly integrating the three modules into a coherent experience. These three learning outcomes (and corresponding modules) offer a process of transformation. As part of this transformation, you will be able to gradually build higher levels of presence – being able to bring your awareness to the “Here and Now”. Meditation invites us to become more present in our everyday life. This course will offer you an opportunity to engage with meditation in a way that will allow that presence to penetrate whatever you are doing during the day. It will shift your mind from one that is constantly busy and scattered to a mind that is focused and connected to the moment. Finally, the course would enable you to share and teach this knowledge; there is great joy in inviting others to grow and transform. The Meditation and Mindfulness teacher training includes a number of special sections where you will learn unique approaches to mindfulness teaching. For example, the special section of “Mindfulness-Based Flourishing” will teach you how to apply mindfulness not only for stress and anxiety but also to increase happiness, meaning in life, hope, and resilience. Another special section, “Organizational Mindfulness”, will teach you how to apply mindfulness teaching in organizations. The special section of “Mindfulness Games” will teach you how to offer mindfulness through games, a highly-effective teaching technique which appeals to most students and clients. Those are unique teaching sessions and they reflect the innovative teaching we offer as part of this training. 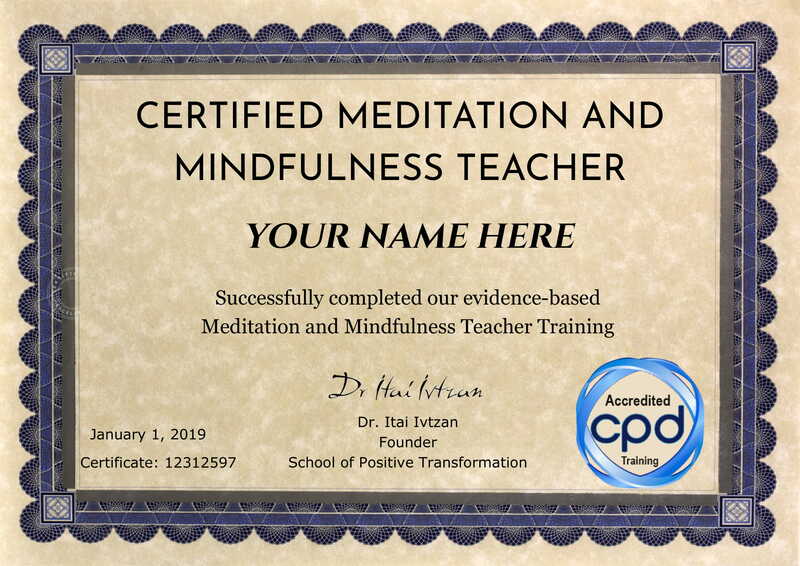 The Meditation and Mindfulness Teacher Training has been internationally approved and validated by the CPD (Continuing Professional Development). The CPD Certification Service was established in 1996 as the leading independent CPD accreditation institution operating across the industry to review and accredit professional institutes and academic bodies. The Meditation and Mindfulness Teacher Training is an accredited CPD course. It means that the certificate has reached the required CPD highest standards and benchmarks. 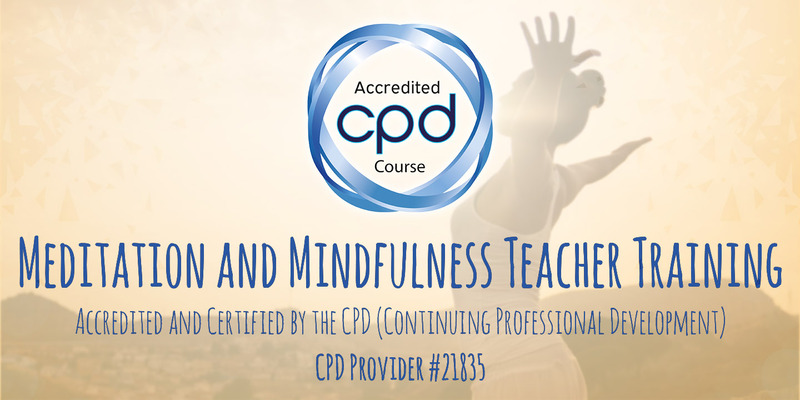 The CPD Certification provides your Meditation and Mindfulness teacher certificate with a recognized accreditation which is internationally respected all over the world. As the course is recognized by the CPD, you can get insured for the meditation sessions with your clients, students, and groups. Once you have completed the training you will receive a formal certificate indicating you are a certified meditation and mindfulness teacher. Our students find the training inspiring and effective; read their testimonials, they love it. And yet, we want you to feel safe as you enroll in the training. For that purpose, we offer a 30-day 100% money back guarantee. You can cancel your enrolment at any time within the first 30 days of the training, and receive a full refund. During the training course, you will complete different exercises to deepen your knowledge and understanding of meditation. You will also teach meditation sessions to someone you choose to work with (friend/family/client) and then write a summary of your experiences and insights following the teaching. These are informal assessments, which will not be marked; they are simply an opportunity for you to deepen the impact of the training. What is the Training's Duration? There are 30 teaching sessions as part of this training, each session includes a variety of videos, exercises, audio files, and handouts. When you join the course the first session will be open for you to study and practice. Every day one more teaching session will open (session 2 in day 2, session 3 in day 3, session 4 in day 4, etc.) until day 30 when the final session is released. Therefore, the minimum completion time for this training course is 30 days. You could study the course as an intensive course and complete it in 30 days – or you could take your time and complete it in a few months, as you wish. Whatever you choose, the course will be open for you for 12 months, so you have plenty of time to complete it at any pace that feels right for you. This Meditation and Mindfulness Teacher Training is unique as it is based on scientific research. Dr. Itai Ivtzan is using theories and practices that have been tested and found to be effective. Once you register and pay you can start the training immediately. What are the Training Fees? The training fees are 490 US Dollars. If you pay with a different currency the fees would be converted automatically to your local currency. You can also choose a payment plan (2 payments of $245). The second payment is charged one month following the first payment. You can pay with any credit/debit card or through PayPal. What if I enrol and change my mind? Based on our graduates’ feedback, we are confident that you would enjoy this training and find it right for you. In fact, we are so confident that we offer a 30-day 100% money back guarantee. If for any reason you are not satisfied with the training, contact us within the first 30 days and receive a full refund.